Clifty Falls State Park located near Madison Indiana, is best known for it’s beautiful Waterfalls and tree lined canyons, but a little known secret lies beneath the woodland canopy. Every spring an immense variety of wildflowers grace it’s woods and canyons with a beautiful display of of color and shape. From the early season Bloodroot to the late arriving Wild Columbine a diverse number of flowers will make your hike thru the park a pleasurable outing, the flowers could be located in an isolated cluster or a patch the size of house. The color palette will range from white to blue to red and every shade of green you could imagine. Many flowers will take on intricate shapes and textures. 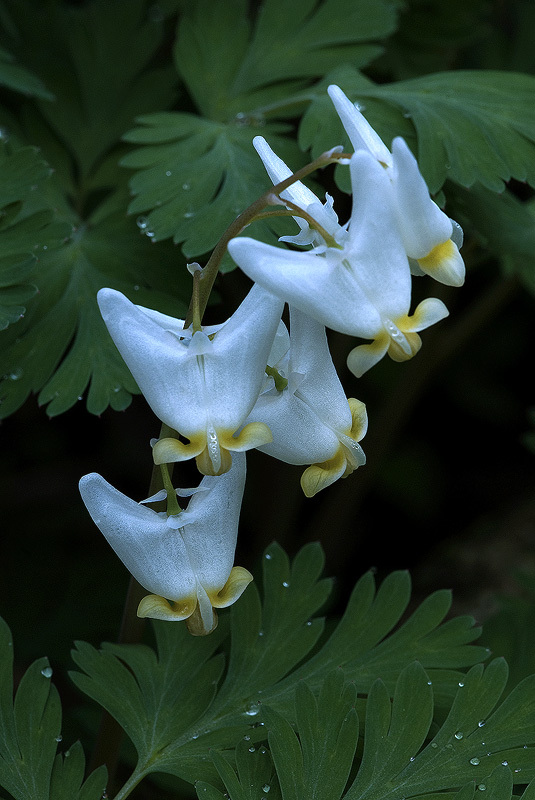 The Dutchman’s Breeches (pictured here) resemble a pair of upside down trousers hence the name, and Squirrel Corn has an odd likeness to a kernel of corn, but I have no idea where the squirrel comes in. Trout Lily has a pattern on it’s leaves that resemble the patterns on a trout and of course bluebells have an uncanny likeness to bells. There are too many more for me to list here but as I gather more images I will keep sharing a little more of my outings in the park and surrounding areas to give you somewhat of an idea as to what a beautiful area I live in. Thanks for stopping by and taking a look !! Beautiful composition on this one, Bernie. I like seeing those too because the don’t grow around here. It’s very nice to see many different flowers from different parts of the world. I have a Friends Award for you !!! Beautiful image! I hadn’t realized there were flowers blooming already….I will have to get out and about. Dutchman’s Breeches are one of my favorites of the early season. You hit the whites perfectly. Excellent capture, Bernie. I am keeping my eye out for Dutchman’s Breeches here but so far nothing. Well done! Dutchman’s Breeches – hilarious name?!? Great pic. The rain drops look like perfectly placed glass beads. YOu should really check out http://www.canvaspress.com for printing. They have a 10% off promotion this month for spring. Code: Spring. What type of lens do you shoot with when photgraphing the flowers? A lovely Spring photo of your beautiful Indiana flowers. LaTease I use a 150 2.8 Sigma Macro lens, very rugged and affordable, most used lens in my camera bag !! Ok…I’m going to add that lens to my list of lenses to purchase. thanks Bernie! beautiful arrangement and lighting Bernie! Just the way I like my photos and art Bernie, lots of contrast. Beautiful shot. Oh YEAH!!! I MISS YOU!!! Thanks for stopping by guys !! I lived in Indiana near the park and it was a beautiful place !